Each one of us is a winner in one way or another. Do you believe that? I am a winner of a special lottery – a lottery that is not exclusive to me. In fact it can have an infinite number of winners. The best part is that the jackpot never diminishes. The treasure that I have inherited is however buried, and I have to work hard at discovering it. 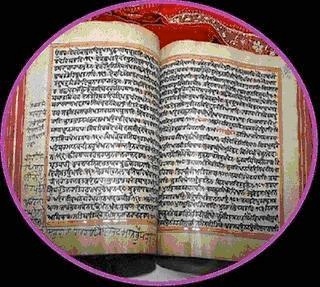 I am referring to the immense jewels and wealth of universal truths embedded in Sri Guru Granth Sahib Jee (SGGS). This is my inheritance, riches that have been passed on to me by my ancestors. I feel both privileged and extremely thankful for this powerful presence in my life. A person who has inherited an unearned wealth can become very careless and spend everything very quickly, thus going from debit to credit or let’s say going from positive to negative. By choosing not to bother finding the treasures hidden in my precious inheritance (SGGS) I can carelessly throw away everything. I let my life pass me by. A person can become a hoarder- one who puts everything into a bank account. Just content in the knowledge that there is something there but personally continues to live a life of a pauper. By wrapping my inheritance (SGGS) in beautiful ramalas and following meaningless rituals I never put the effort to actually find the treasures and thus never apply them in my life – treasures that were meant to make me a prince and princess. I still live in spiritual poverty. A person can acknowledge the preciousness of the wealth, realize its full potential, and invest in it prudently thus using it to become more affluent. By putting in effort (simran, sangat, seva) I start my journey of inner growth – my road map to hidden jewels. I slowly realize the immenseness of the spiritual wealth; I learn to apply these secrets in my own life. I begin to realise that the more I share the more I grow. The potential is endless. Does this analogy work? Maybe you can think of one that is even better. I have been through all three stages in my life. I was at Stage 1 (careless, unaware) during my teens – the reason for this was a lack of direction. I was absolutely engrossed in my studies. I then got married and much older now I progressed to Stage 2 (aware but never bothered to understand the deeper meanings). Religion for me was dry, loveless ritualistic procedures that I followed each Sunday. Then a miracle happened. I won another lottery. Bauji and Mataji came into my life. My life was transformed. It felt like I had just woken up. Bauji showed me how to make theory (gurbani treasure) into a practical, realistic tool (sangat, simran,seva) to apply in my life. Himself an embodiment of Love he lived and breathed gurbani. He was a living example of what one could achieve from following the dictates of gurbani which comes directly from our Gurus. I learnt to value Gurbani. I learnt to how to make the required effort to get to know these treasures. I never realised what I had been missing. How does one find words of deep gratitude? There aren’t any. One can only feel it. At the Ottawa Samagum’08, during the time Sikhs all over were celebrating the 300th anniversary of SGGS Jee, we shared a power point presentation in the children’s class. Some of you who were there might recall it. You might also recall that we discussed the urgent need of knowing the secret code for deciphering our gurbani, our treasure. The secret code is -you have to know Punjabi – Gurmukhi. I wonder how many of you have started learning Punjabi so that one day you too will be able to find the treasures. You cannot rely on translations – they are someone else’s interpretation. Remember you, yourself must be your own guide.